While the quality of your diet can affect your health at any age, maintaining a healthy lifestyle and eating clean is even more important after age 50. Plenty of chronic and serious diseases, from cancer to heart disease, become more prevalent when you're 50+, and eating right can help mitigate your risks — plus, give you the energy to need to stay active and healthy well past middle age. Eating healthy after 50 doesn't have to be difficult, either. Just include these healthy foods in your diet to get the nutrients you need, and avoid foods that will zap your energy and contribute to the aging process. Veggies are an essential part of a healthy diet at any age, but these three greens are especially important after 50. The reason? They’re packed with two carotenoids, called lutein and zeaxanthin. This power couple offers powerful protection for your eyes, since they help to filter the blue light that might otherwise damage your retinas and contribute to eye diseases like macular degeneration. Since eye diseases often develop later in life, focus on getting more of these veggies now to protect your peepers. Try roasting broccoli with garlic and lemon or enjoy a raw kale salad tossed with blood red oranges. Spinach and kale are often associated with smoothies nowadays — but if you’re serving up that veggie smoothie with lots of added sugar (or honey, or maple syrup, or agave…) you should rethink your choice. Sweetened smoothies can quickly rack up dozens or even hundreds of calories from sugar. Not only can all that sugar add to weight gain, but it can also make it difficult to control your blood glucose levels — and chronically high blood sugar can damage your eyes, kidneys and other tissues. Sweeten your smoothies with a half-cup to a cup of fruit. Over time, your palate will adjust to the lack of sugar. A half-grapefruit in the morning might feel like old-fashioned diet food, but it’s worth revisiting this healthy classic. Citrus fruits like grapefruit, orange, lemon and lime all supply tons of vitamin C. Your body needs vitamin C to produce new collagen — and that’s especially important after age 50, since your collagen tends to break down more quickly as part of the natural aging process. Maintaining collagen production not only keeps you skin stronger, more elastic and youthful, but also strengthens your hair, blood vessels, joints and other connective tissues. And on the other end of the anti-aging spectrum we have fried foods — one of the worst things you can eat if you’re trying to stay youthful. Fried and fatty foods are packed with calories, thanks in part to all the fat they contain. Breaking down the fat creates reactive compounds, called free radicals, that have the potential to damage your cells and accelerate the aging process. Of course, fried foods have other drawbacks as well, from contributing to diabetes and obesity to increasing your risk of cardiovascular disease. Just say no! Healthy fats benefit people of all ages, since the fat in your food makes certain nutrients easier to absorb and protects against nutrient deficiencies. But choosing the right fats is especially important as you age, since you face a higher risk of developing cardiovascular disease than you did in your youth. The unsaturated fats found in olive oil and fatty fish (like salmon, sardines and tuna) help manage your blood cholesterol. Combined with an overall healthy diet and lifestyle, they can help keep your heart disease risk as low as possible. Add salmon to your diet by either baking it, pan searing it or grilling it. Once thought of as a healthier alternative to butter, margarine should now top your “DO NOT BUY” list. That’s because making some margarines involves a process called hydrogenation, during which the fats undergo a chemical change that turns them from liquids at room temperature into solids. Hydrogenated fats are also called trans fats, and they’re the worst fat you can eat when it comes to raising your heart disease risk. The U.S. government has passed legislation banning the use of hydrogenated fats, but it has not yet taken effect — until then, spread organic, grass-fed butter on your toast. When it comes to healthy eating, pulses — lentils, beans and peas — are about as good as it gets. A triple threat, pulses are extremely low in cost (think pennies per serving!) and they’re loaded with filling fiber and protein. Also of note: they have a low energy density, which means they maintain a relatively low calorie count despite a generous and filling serving size. Eating low energy density foods becomes more and more important as you age, since your metabolism can slow down and trigger unintentional weight gain. Including more pulses in your diet makes it easier to rein in your calorie intake without feeling deprived. Here's how to properly cook lentils. And on the other end of the spectrum, we have granola. While granola may sound healthy — after all, it’s just oats, nuts and fruit — it has extremely high energy density. In fact, a quarter-cup serving of a commercially available granola has 120 calories... and who eats just a quarter-cup, anyway? Foods with a high energy density are more likely to make you gain weight, since they pack lots of calories into a small serving. And you’re more and more likely to put on weight as you age and your metabolism slows down. If you love granola, try muesli instead — you’ll get a similar taste for fewer calories. If you haven’t made a habit of eating whole grains, it’s time to start. Not only do whole grains offer more texture, which can make your food feel more filling, but they’re also a great source of dietary fiber. Getting enough fiber is essential for staying, um, regular — but fiber also helps lower the risk of digestive disorders like diverticulitis, which tend to be more common in older adults. 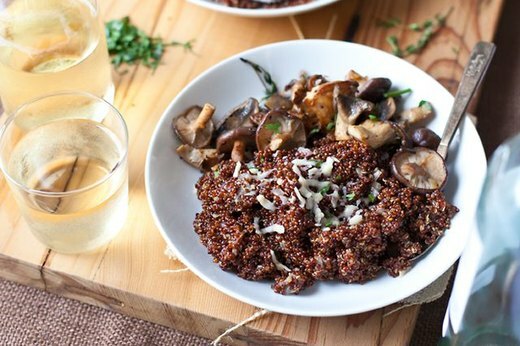 Pick up whole grain toast, serve brown or wild rice as a staple side dish, or enjoy a hearty dish of a wild mushroom quinoa risotto. Switching to whole grain means cutting out refined (white) grains and flour — and that’s a good thing, because these foods do almost nothing for you. While refined grains are packed with calories, they lack the fiber that would otherwise make you feel full. A diet high in refined grains also raises your risk of type 2 diabetes and heart disease — diseases that you’re already facing a higher risk of age you age. It may be tough to reset your palate to appreciate whole grains when you’re used to refined ones, but it’s worth the effort to ditch as many of these processed grains as possible. Did you make any changes to your diet when you turned 50, and did any of our picks surprise you? Tell us about it in the comments!